On the second day of the four-day two-district tour, the Governor, P.B. Acharya, accompanied by State;s First Lady Smt Kavita Acharya visited the Buddhist Monastery at Namsai on 5th August 2017. The first couple offered prayers and met the Monks. Interacting with the head priest and other monks, the Governor requested them to create awareness against drug addiction in the villages. He said that drug menace is crippling the society and each and every one must shoulder responsibility in its eradication. As the National Ambassador (Nav Ratna) for Swachh Bharat Abhiyan, the Governor participated in the cleanliness drive in the morning. He was joined by the First Lady, government officials, security personnel and students. The Governor called upon the people to instil cleanliness as a second nature. It should begin from home. Along with clean environment, we must try to clean our mind too, he added. Later the Governor flagged off the ‘Open Defecation Free’ mission organised by Public Health Engineering department. The Governor visited the District Hospital and Government ANM School at Namsai. Interacting with the doctors and staffs, the Governor called for optimum utilization of infrastructure and resources. The Governor also addressed the students of Government Higher Secondary School, Namsai and congratulated them for the good results in CBSE. Advising the students, the Governor said that the benefit of their empowerment though education must go to the society. They must imbibe skill along with degrees. India has great potential and you are the soldiers. Your education must make our State Golden, he exhorted. The Governor exhorted them to be proud of the cultural heritage, dialect and traditions. 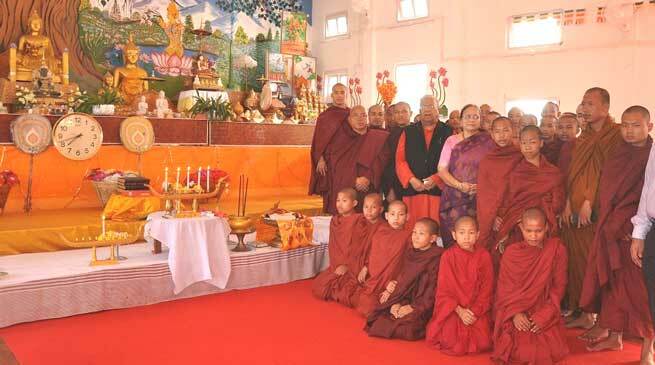 Before leave Namsai District, the Governor visited the famed Golden Pogoda at Tengapani. He expressed hope that it will give another thrust towards religious tourism in the State.